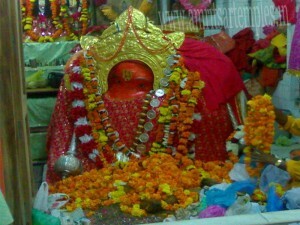 Sri Hanuman Mandir of Hanuman Gadi, Ayodhya is seen in the sitting posture. Sri Bara Hanuman of this mandir is magnificent and huge in size. Lord is seen sitting in a laying posture as if He is in relaxing mood. After all he is the one who had united Sri Rama and Sri Sita [from Lanka]. Now here in this kshetra He is the one who had united Sri Rama and Sri Luv and Kush, His sons. Sri Hanuman has all reasons to relax. Pray on to Him to get rid of all worries and relax. West Bengal celebrates ‘Durga Pooja’ , Gujaratis ‘Dandiya’, Amritsar celebrates ‘Langoorwala Mela’. Many couples seek blessings of Lord Hanuman for a male child. When their wishes are complete they come here to this mandir during navratras and pay their tribute to the Lord for the blessings He had bestowed on them. The couples seeking for the male child tie a thread on the ancient banyan tree in the court yard of the Bara Hanuman temple. When their wishes were fulfilled, they come here during ‘Navratra’ along with the male child. During these nine days they sleep on the floor, observing fast. They take one time food of raw vegetables and fruits. The recitation of Ramayana especially Sunder kant goes on throughout the nine days. The male child is dress as langoors during the mela, in bright red outfits laced with gold or silver lining. Their faces are smeared with fuller’s earth in order to look like langoor and a big tail with an artificial mace completes the appearance. On conclusion of the Navratra, the langoors will take off their langoor outfits, near the banyan tree where their parents had tied the thread. Now the mother of the langoor will untie the thread on this ancient tree, since the Lord Bara Hanuman had fulfilled their wishes. This annual function at this ancient ‘Bara Hanuman Mandir’ starts with the beginning of navratras. There are people from far off places, even from aborad who visits this temple during this festival. Ashwamedha yajna usually performed by the Emperors by let loosing a horse, and wherever the horse sets its foot, it is said to be the Emperors territory, if the horse is not challenged. So also Sri Rama let loose a Ashwamedha horse to stake claim of territories, while his wife Sri Sita was living in exile. Sri Sita who was under the care of Sri Valmiki had given birth to twin sons namely Luv and Kush. It is said that Luv and Kush had challenged the Aswamedha horse not knowing that it was set out by none other then their father Lord Sri Rama. Once challenged fight ensued and Sri Rama’s brothers were knocked off. The mighty Sri Hanuman the humble devotee of Sri Rama came to confront Luv and Kush. The sons of Sri Rama had tied Sri Hanuman to the banyan tree. It is said that it is the same banyan tree couples are tying thread wishing for a male child, where Sri Hanuman was tied by the Luv and Kush. The Hanuman mandir and the tree is said to be very ancient.